EGC paper testing rooms are controlled environment laboratories, designed specifically to meet the quality needs of the paper industry. These rooms are guaranteed to meet the guidelines established by the Technical Association of the Paper & Pulp Industry (TAPPI). TAPPI standard T402* sets rigid requirements for conditions used in physical testing of paper products. Standard conditioning temperature of 23°C must be maintained within ±1°C and 50% relative humidity within ±2%. To assure uniformity for various testing needs, these conditions must be maintained across the entire laboratory work area. EGC's custom engineered solutions are designed to maintain these conditions, providing a comfortable and uniform environment for both people and test equipment. 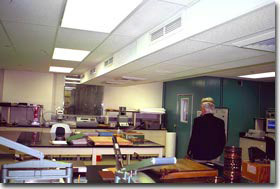 Paper testing rooms are built from prefabricated insulated panels and typically include drop ceilings and fluorescent lighting. Insulated entryways, double-glazed windows, and color coordinated interiors make the work surroundings attractive as well as functional. Where new construction permits, rooms can also be integrated with surrounding architectural features. Air flow systems are specially engineered to meet the requirements of each individual facility. They include dedicated air handling equipment, with refrigeration and humidity control. Aspirated sensor element module, computer controls, and various recorder options provide the necessary control and system information. 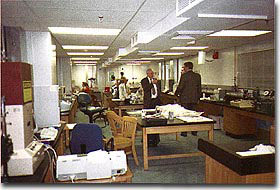 In some cases, like the Herty Foundation lab shown at the right, facilities can actually include a room within a room. 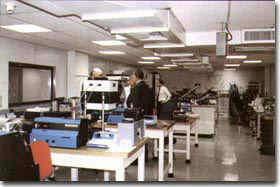 In this case, a separate walk-in room for elevated temperature use is incorporated within the larger lab, without upsetting the controlled conditions. If you are planning a new facility, or updating a current one, contact us to discuss your laboratory environment requirements. *TAPPI T402 - Standard Conditioning and Testing Atmospheres for Paper, Board, Pulp Hand Sheets, and Related Products.